I still have some photos from that last summit trip I haven't looked at yet, but suspect this is one of the last good ones. It was wonderful to be back on the summit again and am now getting used to life back at sea level. Lots of admin type stuff to deal with, which I hate, but it comes with the job these days. This one was taken well after sunset - all the colours had gone and it was very dark so things are a little smoothed (OK, out of focus). Shortly after this I was back inside the control room hoping to take data on a few planets but the clouds that were above us at sunset descended in the cold air and then hung around the summit all night, so we didn't get anything this night. Fortunately, I can report that the visiting NASA team got some great data soon after this and it coincided with me leaving the summit, so I think I might have to review any future summit support that includes me. At $200 a head I hope these guys enjoyed the sunset! We like to give them a show at UKIRT (pictured) by opening the dome and ventilation system early. It always attracts attention when the dome slit opens. I haven't the heart to tell them it's not for them, though, we open early so the dome cools down and we don't have to deal with local turbulence once the sky turns dark. Between dome opening time and a dark sky I try to stay incognito - I'm fed up answering questions about UFOs, black holes and my accent! Three sunset pictures from the last few days of the Celeste run at UKIRT. Not my best but it was really windy on those days. The winds calmed down on the last couple of nights but the clouds had dissipated by then so the sunsets were kind of boring and I didn't bother - I was also a little busy those nights. You never know, maybe this time next year I'll get another chance to take some Mauna Kea sunset shots! Subaru and a setting sun. 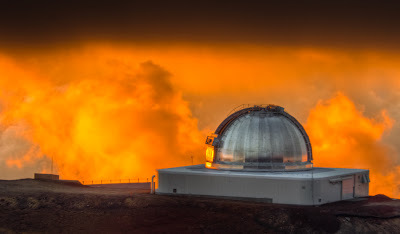 The Subaru observatory is closed right now due to a nasty incident they had with some glycol. I hope things get fixed and cleaned up soon. I was told they might be looking at being closed for six-months but they have recently sent out an email about their next laser show later this month, so am assuming they'll be open again very soon. 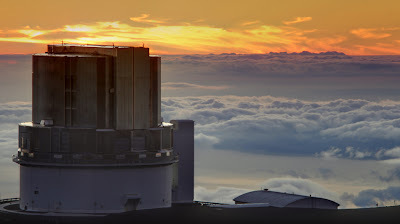 The NASA IRTF with some summit-level clouds at sunset. It almost looks as though there's a brush fire nearby, but the colours are simply due to the sunset. 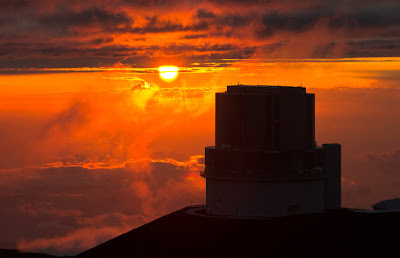 Despite a good forecast most of the summit observatories remained closed this night due to fog although one or two managed to open towards dawn when the clouds finally decided to leave. The CFHT the same evening. It had an amazing glow from sunset clouds in the valley but thick mid-level clouds everywhere else made opening up impossible. 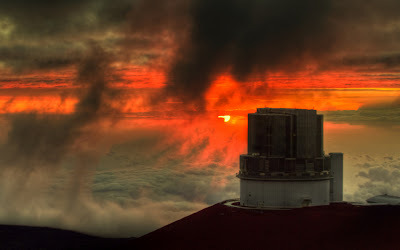 Incidentally, our visitors from NASA Goddard went home today very happy especially after a great last night on the summit. 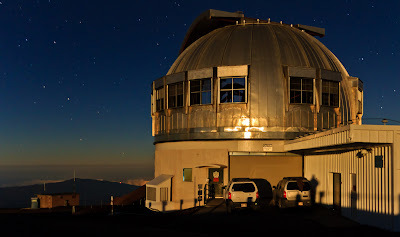 Conditions were excellent and they took a lot of superb data on Saturn and its storm, Uranus and Jupiter. I even found a little time to take some more data on Pluto not that I'm a planetary scientist or anything, just wanted to see how our image quality was holding up and if there were any changes. Pluto and its moon Charon were pretty obvious in the 2.2-micron data. Saturday evening, July 16th 8:30 pm Hawaiian Standard Time, 2011. Most people are out on the town enjoying themselves, having fun with family at home or at a party. Me? I thought I'd pop outside and take a photo of UKIRT observing Saturn with the Celeste visiting instrument. You can even see my shadow if you look carefully enough! 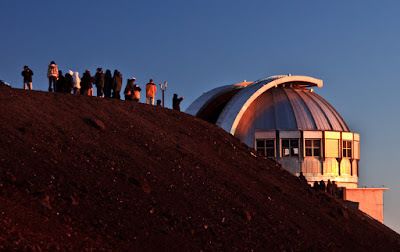 Apart from the odd day or two I've spent the last two and a half weeks on Mauna Kea and have just got down for a bit of a break. The NASA Goddard team are still on the summit of Mauna Kea and from a report I got just minutes ago have taken some stunning data on Saturn's super storm. Tonight is their last night at UKIRT so it seems all the effort they and we have put into making this happen has been worth it. The other day I went out to watch the sunset as I always try to do when I'm at the summit. Unfortunately I was a little rushed this time as we'd been dealing with several telescope and instrument complications and problems but just had enough time to set the camera on the tripod and take a few pictures. The scene was wonderful until I realised my camera wasn't working as it should. The sun was still above the high clouds and the colours were amazing but the memory card in my camera was screwed, at least that was my initial diagnosis. So I rushed back into the dome to get a replacement card ("rushed" being a relative term at 14,000 feet) and a couple of minutes later managed to walk with somewhat wobbly legs back to the camera. Oh boy, it's so easy to forget how little oxygen there is at the summit. One of the Celeste visiting instrument team members had kindly stood guard next to my camera while I was gone but probably thought there was some drunk summit madman heading towards him until I got close enough for him to recognise me. Anyway - too late - the sun had appeared below the mid-level clouds so the scene was gone but I took a couple of pictures anyway before I went into a coma. This is one of them. I still don't know if it's crap or not. Just another picture of the NASA IRTF I'm afraid (taken yesterday), but wait, almost 20 years ago to the day a person who is currently up at UKIRT taking data was at the IRTF with an instrument called Celeste. That was 11th July 1991, but tonight, July 12 2011, Celeste is at UKIRT. Don't worry, it has been upgraded a little bit since then! 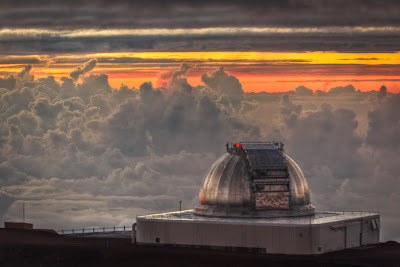 11th July 1991 is an important date in astronomy, especially for the telescopes that existed back then on Mauna Kea - it was the first total eclipse of the sun observed by major astronomical observatories. NASA scientist Don Jennings, who I'm sure is fretting and stressing getting Celeste to work on UKIRT, is, as I write this, working frenetically inside our dome. Actually, I'm sure that isn't the case, he's one of the most laid back people I've met and hasn't aged a day since this Nova episode of the 1991 eclipse was made in which he's a co-star. It's a look back in time for me - 1991 was when I first visited UKIRT as a postgraduate student although it was a few months before the eclipse. Now I'm in charge of the place. How things change in such a short time. For anyone interested, Don first appears at around the 07:50 minute mark in the video and then again at approx. 20:40 and 29:30. 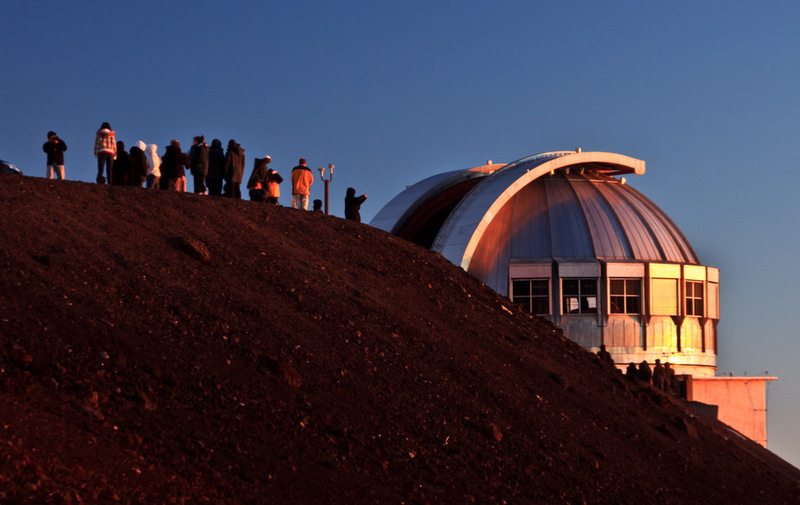 Then it gets exiting around the 33:40 minute mark and continues from there on switching between the various Mauna Kea eclipse observing teams. At around 46 minutes they do what I would have done had I been up there although of course I'd have done it in a stately English manner with a cup of tea in my hand and a comment to everyone along the lines of "jolly well done!". 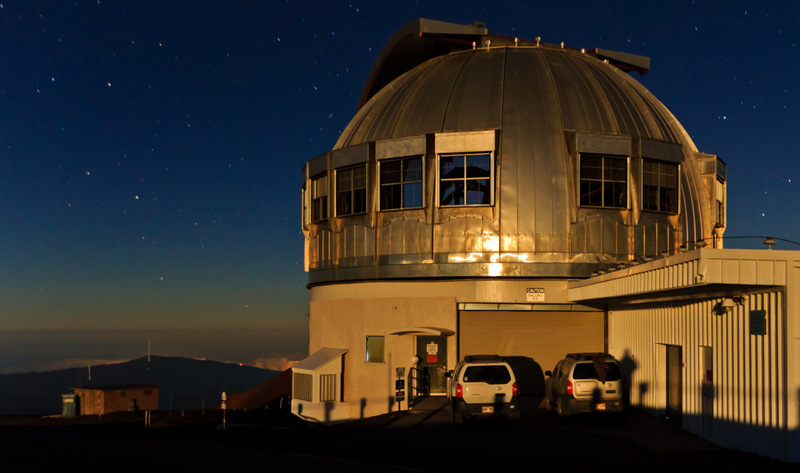 Although it's very dated now, the video does give a reasonable impression of life at a Mauna Kea observatory, especially when there's a new project to be done which is exactly what I've been doing the last couple of weeks. I'm completely knackered because of it, but it's been tremendous fun and tonight we're starting to get the science data we've been preparing for the last couple of weeks! We're hoping to do a little planetary science over the next week or so using an instrument designed and built by NASA scientists called Celeste. It's a mid-infrared high-resolution spectrograph designed to identify molecules in planetary atmospheres. I'm no planet expert but do have a background in spectroscopy and mid-infrared astronomy so am eager to help make this little venture work before we go back to surveying the infrared universe for UKIDSS with WFCAM. Plus this is fun if a little exhausting. 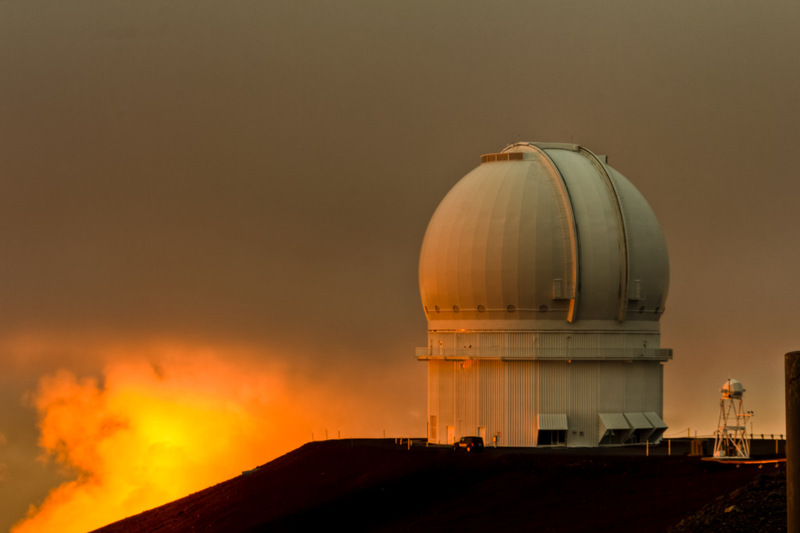 Commissioning astronomical instruments has always been the most enjoyable part of my career in the past, and it's nice to get a chance to do something like that again. As part of the preparations, UKIRT had to be converted back to Cassegrain mode for a couple of weeks and that involves a lot of night time calibration and testing work. On our first night after the conversion we did every measurement and calibration possible other than reshaping the primary mirror to take into account gravity. 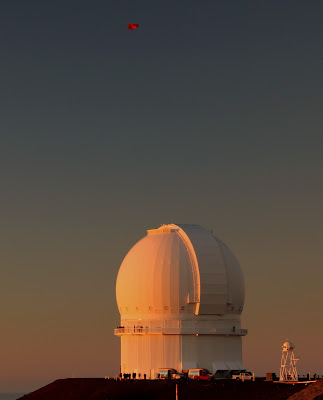 The latter takes several hours of observations and couldn't be done right at the start but despite that Jack (the telescope operator) and myself thought we'd have a quick test of the telescope by taking some infrared images of Pluto using a facility instrument called UFTI. I didn't expect much, after all the primary and secondary mirrors hadn't been calibrated, but we had a nice surprise! In the top image, Pluto and its moon, Charon, are easily seen. Charon wasn't discovered until 1978 and even then the discovery was controversial. Ground-based telescopes are always subject to the effects of the atmosphere and until quite recently resolving Pluto and Charon was a very difficult task. 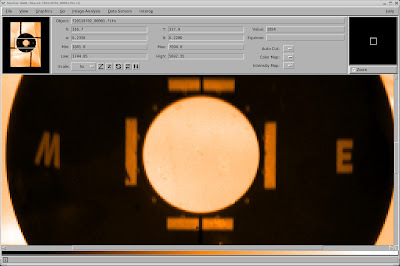 Imagine my surprise when the automatic data reduction software spat out the image above (oh, OK, it didn't have the circle in it!). 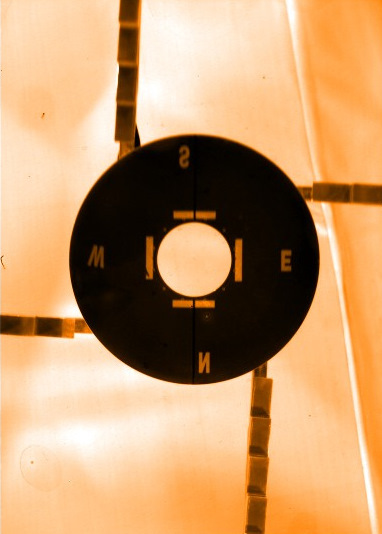 Remember, the telescope wasn't ready for this type of observation, I just wanted to see what image quality we had before working on the engineering models for the mirrors. I was also curious to see if we could figure out how to find Pluto in the first place! The second image is actually two images combined. 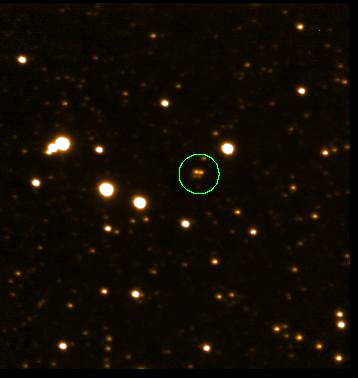 I wanted to make sure that we were actually looking at Pluto so we took another image a few minutes later; the idea being that the stars should stay in the same place but Pluto and Charon would have moved with respect to the background stars. They did and we could still see Charon. 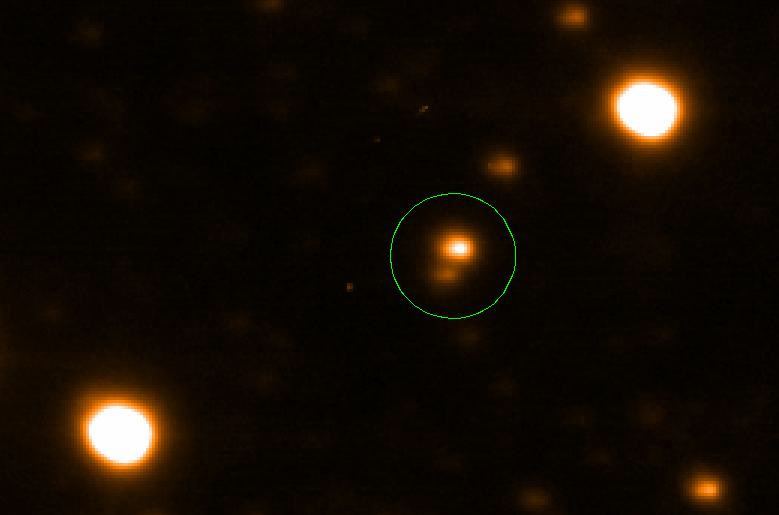 OK, not as exciting as the most distant quasar ever seen, but given it's been nearly three years since we were last in this mode, the telescope had just been handed over by the engineers and I'd forgotten everything about running things in Cassegrain mode, I was rather impressed! Pluto, now classified as a dwarf planet, is approximately 2.9 billion miles away at the moment and it takes light over four hours to reach us from there, just to give you some idea of the scale of our Solar system. It's about a fifth the diameter of the Earth and its mass is only about a fifth of our own moon. Charon is only about 750 miles across and only about a fiftieth of the mass of our own moon. The NASA IRTF waiting for sunset high atop Mauna Kea on Independence Day evening. 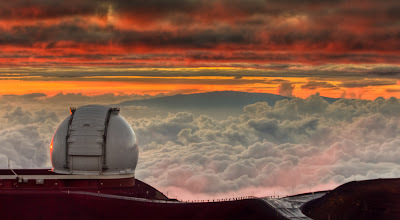 Haleakala on Maui is visible in the distance. A photo of the IRTF seemed appropriate as I've been working with a group of NASA scientists on the mountain since late last week. Subaru and sunset clouds taken a short while ago just after sunset on Mauna Kea's summit. It's been a long time! What a difference a day makes. 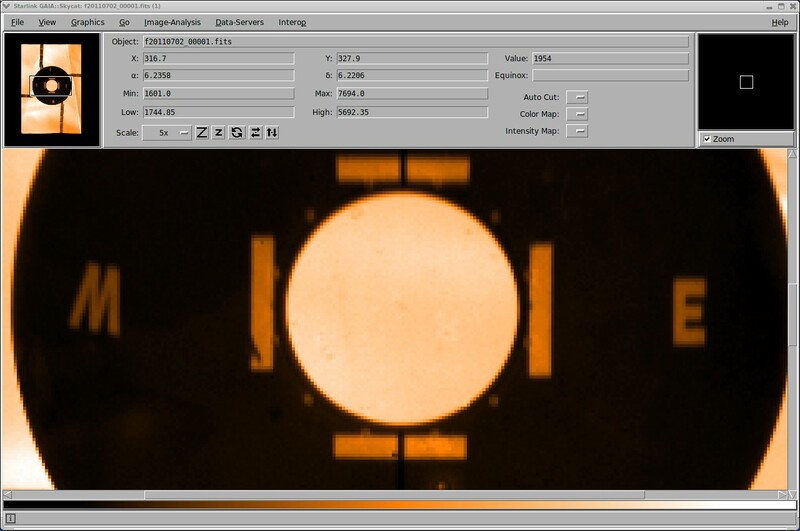 Yesterday I reported that we had ice on or near our wavefront sensor which would make it impossible to align the telescope, but an overnight bake on our oven fixed the problem, and the image above shows the result. Now I have to figure out the mirror-image results of the N, S, E and W markings and why the E is the wrong way round! More importantly, the secondary mirror could now be aligned. It turned out I didn't have to make any large adjustment at all, our engineers reinstalled it perfectly. The bright circle in the middle, which is the secondary, has to be centered between those bars, and it was almost spot on first go. In addition, our 1-2.5 micron camera, UFTI, is back on the telescope and working perfectly and while all this is going on a filter problem with WFCAM seems to have been fixed or at least a work around has been found. All this in four days. At the end of the afternoon I fully expected us to still have some problems, you have to remember it's been 30 months since we were last in this mode (Cassegrain) and everything has been updated since then. Thanks to a wonderful group of technicians, engineers and software people we left the mountain late this afternoon with everything working perfectly. Given all this work is for a couple of weeks of night time observing while WFCAM is undergoing planned maintenance, the effort everyone has put in is phenomenal. Despite all the cutbacks and uncertainty about our future, we still have the most incredibly talented and dedicated staff. After fifteen years working with them I'm still in awe of what they can do.